It’s hard to compete for the attention of travelers to California when your neighbor to the north is San Francisco, arguably one of the country’s most beautiful cities, and Los Angeles to the south, which, let’s face it, doesn’t have to work hard to get noticed. It’s lucky for the Central Coast, that coastal stretch of Central California between those aforesaid cities, that it’s been blessed with enough natural beauty, sandy beaches, esteemed wineries and assorted species of wildlife that it doesn’t have to work all that hard for a place in the spotlight. After a short stay in Los Angeles and a stop in Santa Barbara to celebrate the 4th of July, my travel partner and I got back in the car and headed north. Our first stop, Morro Bay, took about two hours to drive to, beginning with a jaunt through countless acres of farmland, where much of the country’s produce comes from, followed by a lengthy stretch where we were treated to panoramic views of long, sandy beaches with the sparkling waters of the Pacific Ocean stretching out toward the clear sky. As we approached town, iconic Morro Rock appeared on the horizon, jutting out from the ground like a giant road marker leading our way into town. Morro Rock is actually a 581-foot high magma mixture that is the remnant of ancient volcanic activity, one of 13 along the coastline in this area. Stretching out below it is the town’s namesake bay, Morro Bay, a 4-mile-long bay home to an eclectic mix of wildlife including over 200 species of birds such as the great blue heron, the great and snowy egret and red-tailed hawks, as well as many water mammals such as harbor seals, sea lions and California sea otters. 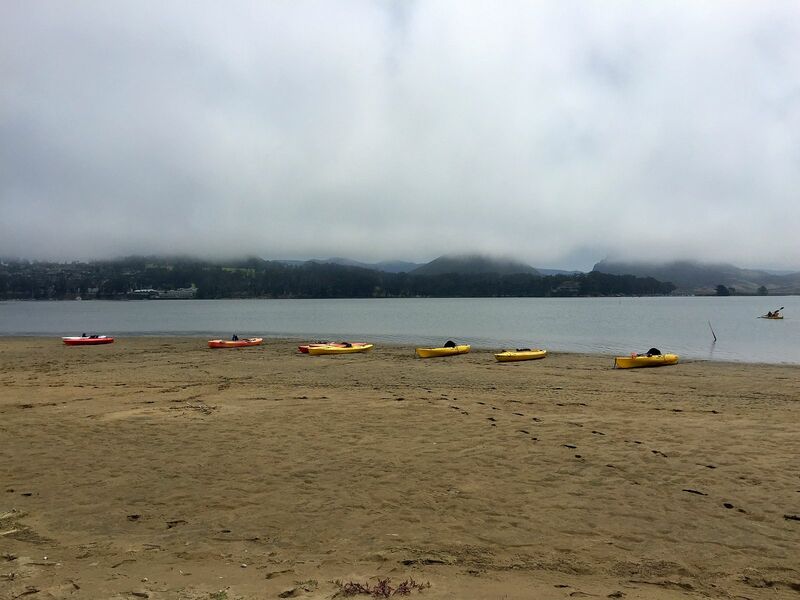 On our first morning out, in order to get a better, more intimate view of the wildlife, we decided to don life preservers and take a guided kayak tour of the bay via Central Coast Outdoors. Founded by former tour guides, Central Coast employ some of the most knowledgeable guides in the area. Leading us out that morning was our guide, Mandy, an ex-competitive kayaker who was thankfully long on patience (her first task that morning was dealing with New Yorkers getting into kayaks for the first time in a long while). Our first stop in the water was a long inlet through the marshland where we encountered about two dozen sea lions lazily laying on the shore’s edge, sunning themselves under the morning sun. Careful not to get too close as to disturb them, the occasional sea lion would lift his head and reveal his long whiskers as we passed by, checking out the new aquatic visitors. On our way back out into the bay, a youngster dove in as we passed and followed along at a distance, playfully watching as we rowed away. After kayaking out to a moored barge — now a newly working oyster farm where we watched the fisherman haul in their take — we made our way to the far edge of the bay and grounded our kayaks along the sandy beach on the spit of land that separates the bay from the ocean. While lunch was being unpacked, we hiked across the tall sand dunes for views of the ocean where the waves pounded the beach with Morro Rock towering in the distance. After a well-earned lunch of freshly made quinoa salad, turkey and tomato sandwiches, walnut apple salad, and of course a couple glasses of local wine, we hopped into the kayaks and rowed back across the bay. As we approached the water’s edge, we began to hear the low din of hundreds of birds calling out. Here on a small stretch of protected land, the former owners of a nearby mansion had planted a grove of eucalyptus trees, which is now the Heron and Cormorant Rookery, a nesting ground for hundreds of great blue herons and great and snowy egrets. Paddling up to the point where we were nearly underneath some of the nests, we could make out the chicks calling out to their parents who were busy scrambling around the treeline with bits of food hanging from their mouths, as well as the occasional toddler who was brave enough to walk to the ends of the branch, but wasn’t quite ready to make the leap, its wings flapping in the wind to gather strength for their eventual departure. Having worked up an appetite from the day’s activities, we cleaned up back at our hotel, the 456 Embarcadero Inn & Suites, a newly renovated, family-owned hotel that transformed itself from a mid-century seaside motel to a slick, boutique inn with sweeping views of the bay and a great location in the center of town. The main street that runs along the waterfront, Embarcadero, is home to a variety of traditional seaside shops including candy stores, knick-knack shops, and even a small aquarium home to an open-air sea lion habitat. This being Central Coast wine country, before dinner we stopped off at Chateau Margene, one of several tasting rooms in town. The vineyard itself is in nearby Creston, and we had a full tasting of their signature Bordeaux-style wines (Cabernet Sauvignons, Cabernet Franc and their Meritage blends). For dinner we decided on The Galley Seafood Grill & Bar, one of the town’s oldest and most beloved restaurants, featuring a revolving selection of freshly caught seafood. We started with an order of oysters — farmed locally as a result of the bay’s recent efforts to rehabilitate the once ailing industry — along with the crab cakes made with the local Dungeness crab, followed by seared ahi tuna and Pacific swordfish. As we walked back home along the waterfront, we looked out across the bay. 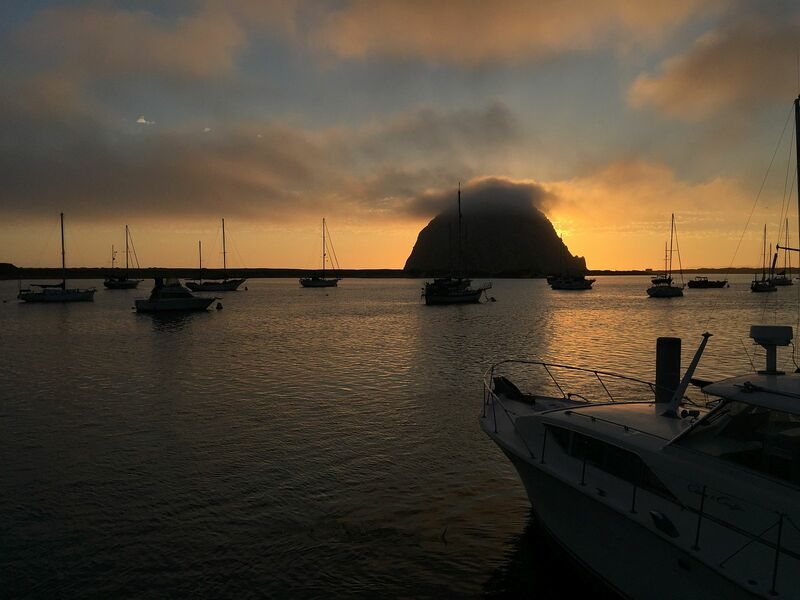 Morro Rock was enveloped in an orange haze, the sun having recently set behind it, and a flotilla of boats bobbed in the water as if setting their bows in the direction of the best view: a fitting view of the bay where so much life here calls home. 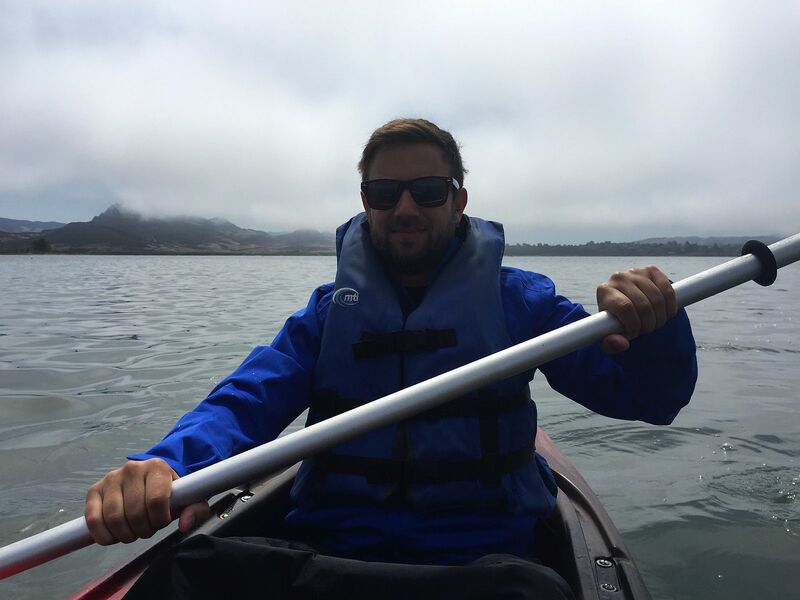 Matt Stabile is based in New York City, and is the founder and Editor-in-Chief of The Expeditioner which was founded in 2008. You can read his writings, watch his travel videos or contact him via email at any time at TheExpeditioner.com.